I had been once before. My parents and I weaved and wandered through Umbria to the hills of Tuscany. It was the year 2000. They carefully planned our route to highlight loves from their previous visit. Assisi, Montepulciano, to Montalcino. We nibbled on Ricciarelli as we combed the cobbled streets. Although we visited a few tasting rooms that day, I did not know much about what I was tasting. 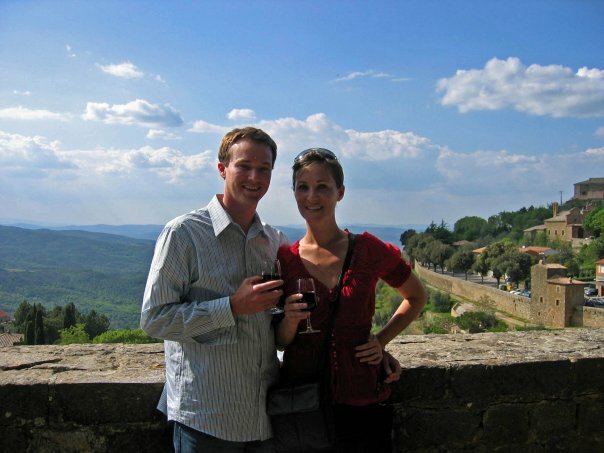 When I returned seven years later, I came with both a husband and a love of wine. Not an abundance of knowledge, but a well established affinity. Our course was defined by both a desire to share what I had seen years before and epicurean exploration. When we entered the medieval walls of Montalcino, we were met with crowds and signs indicating and food and wine festival that was about to begin. Luck was on our side. When the booths opened, there was one thing I wanted:a glass of Brunello di Montalcino. We found a bench overlooking the hills of Tuscany and toasted. Brunello di Montalcino is 100% Sangiovese grown in one of the warmest, most arid climates of Tuscany. It is fermented and held in Slavonian Oak. Fattoria dei Barbi was established as a winemaking estate in 1790 making it one of the oldest estates to continually produce wine in the region. Colombini is the 20th generation heir. With new technology and respect for tradition, the name continues to well represent the region. These grape are hand-harvested and given a “cold-soak” for 48 hours before fermentation. Tonight I will join Gregory Dal Piaz, Snooth’s Editor-in-Chief and Fattoria dei Barbi’s owner Stefano Colombini to discuss five examples of Brunello that are currently available. When the invitation to participate in tonight’s event came, I was thrilled. When I opened the shipment, I was taken back. As I turned over and inspected each label, I couldn’t help but smile. One of the bottles we will be tasting tonight is from the 2007 vintage. The same grapes that were just breaking on the vine as we meandered through the back roads of the region, were potentially the grapes in the bottle I was holding. And I can’t wait to taste them. For more information on tonight’s tasting, please visit Snooth and grab a bottle of Fattoria dei Barbi to join the discussion. Salute! Isn’t it? Can’t wait to return. Agreed. Piemonte is way up on my favorites. Your post got me interested in Fattoria dei Barbi, a Brunello-producer whose wines I have not tried before. Turns out that their Brunello is available at a very friendly price (about €27) so I plan to buy a bottle of 2006 Brunello (absolutely love that vintage for Burnello). Thanks and cheers! I’m glad! I loved those wines! How fun! Enjoy the fabulous tasting. Brunellos are my fav Italian wine! Ah I just got this! You are so kind! We must meet up & share a glass!